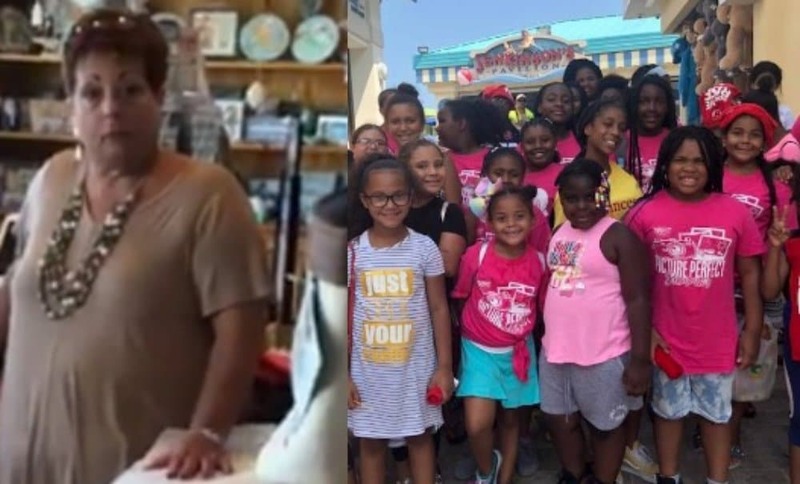 A group of bright-eyed black girls who were eager and ready to buy trinkets at a New Jersey gift shop, were kicked out by a white store employee. And the heartbreaking video of the racist encounter is now making the rounds on social media. The magic in their hearts fizzled and tears started to stream down the littkle girls’ faces after a woman named “Linda” refused to allow the group of campers to shop at the Jenkinson’s Aquarium Gift Shop in Point Pleasant, New Jersey because they didn’t have a chaperone. The employee yelled at the 12 and 13-year-old girls to get out of the store, the NY Daily News reports. On the video, which has gone viral on social media, the camp director challenged the employee saying that the girls went to get their chaperone to prove they weren’t alone. But that apparently wasn’t good enough for the employee who refused to believe that the chaperone was actually the supervising adult. Listen up, Linda—Black don’t crack! Camp director Attiyya Barrett, who heads an organization that offers summer camps and tutoring programs for children, posted the video and pressed Linda about what had occurred. The seven girls who went in the store were part of a larger group of 40 girls between seven and 14 years old from Paterson, New Jersey, on a trip organized by Barrett’s organization, Princess to Queenz. “You guys love to get your phones out to record,” Linda is seen saying to Barrett. “’Cause they didn’t have a chaperone,” replied the worker. “And when they went and got their chaperone, what was your reason?” asked Barrett. “And when she was explaining, what did you just say? What did you just say?” Barnett demanded. “It was a pretty bad experience because we didn’t do anything wrong,” 12-year-old Kierra Williams told northjersey.com. The store owner also threatened to also call security. Since the ordeal went viral, the employee has reportedly been suspended and the gift shop management issued this limp apology. Barrett told WABC that the employee’s suspension was a step in the right direction but more needed to be done. She’s been in touch with the aquarium and is waiting to hear more about how they plan to “rectify” the situation.